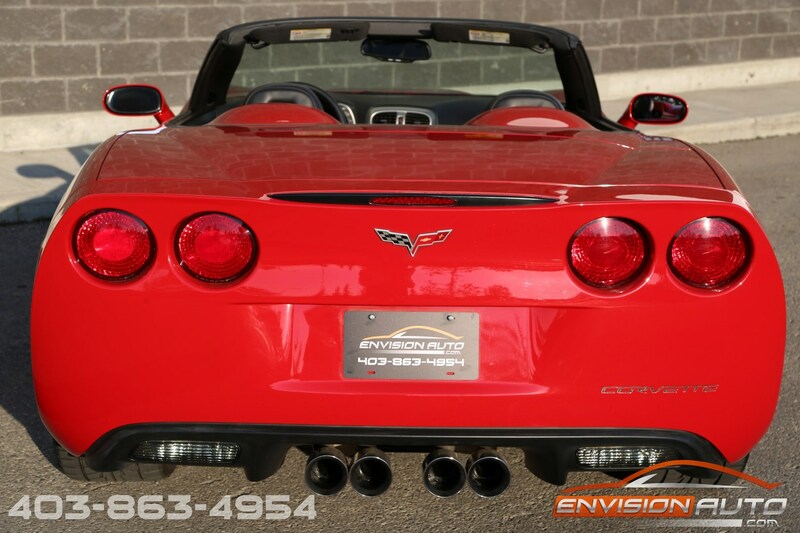 2005 Chevrolet Corvette Convertible 1SB \ Z51 Performance Pkg \ One Owner \ Only 37,000 Kms! 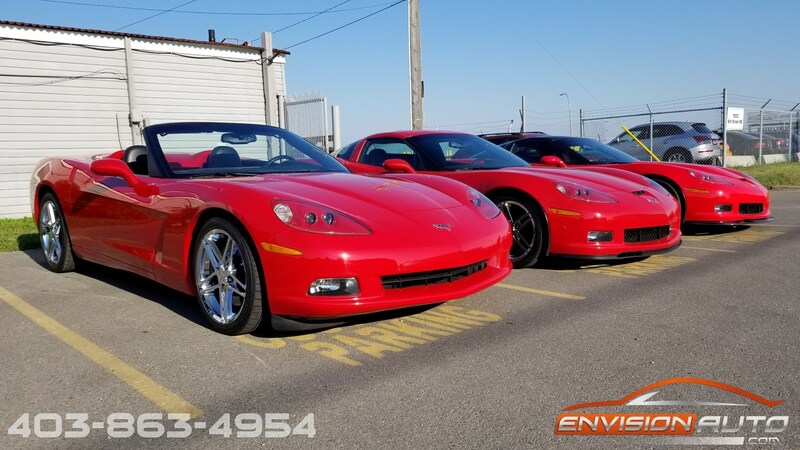 450 HORSEPOWER \ Z51 PERFORMANCE PACKAGE \ 1SB OPTION PACKAGE \ CALLAWAY 6 SPEED MANUAL SHIFTER \ LONG TUBE HEADERS \ B&B ROUTE 66 EXHAUST \ SPOTLESS SINGLE OWNER LOCAL ALBERTA CARPROOF HISTORY REPORT SINCE NEW \ ONLY 37,000 KILOMETERS \ COMPLETE 3M CLEAR FILM PROTECTION PKG! 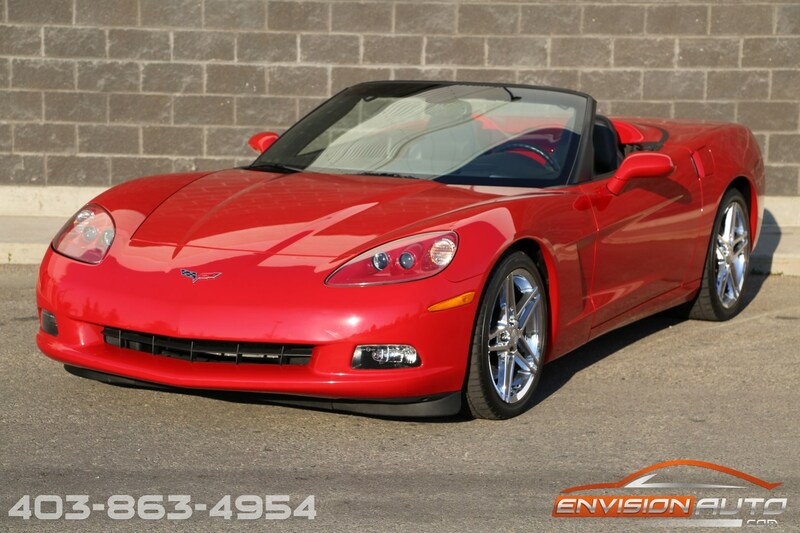 Sold new from Southgate Chevrolet in Calgary, this has been a true ONE OWNER, locally owned Calgary car since new. 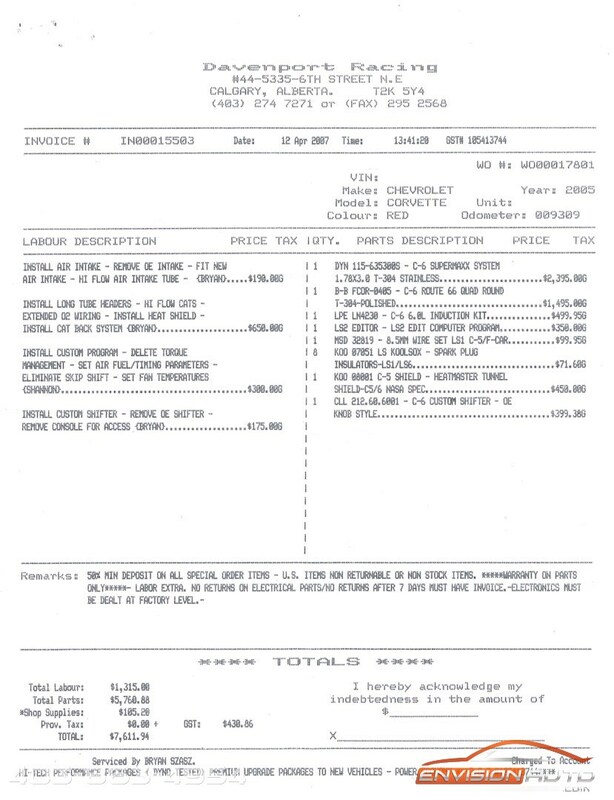 Absolutely flawless CarProof history report with zero previous accidents. 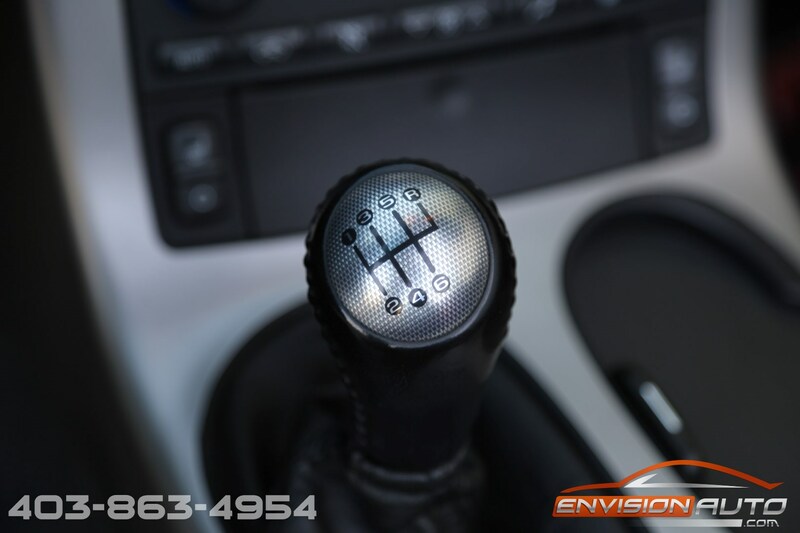 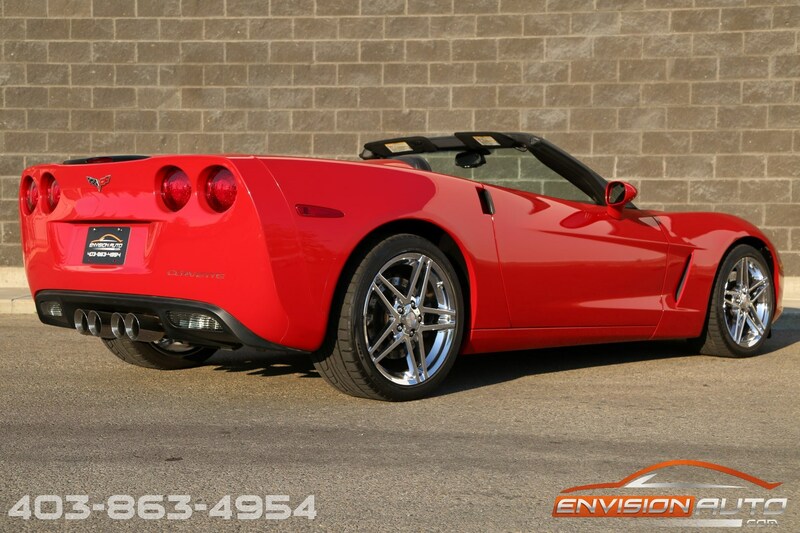 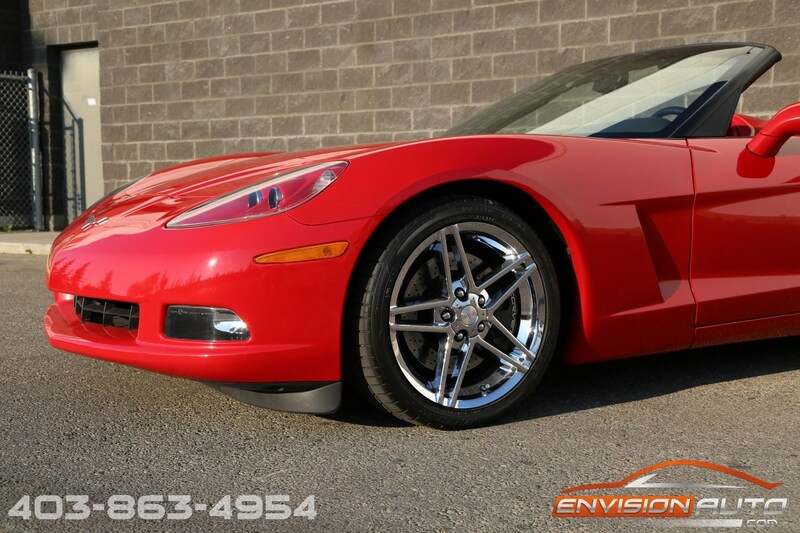 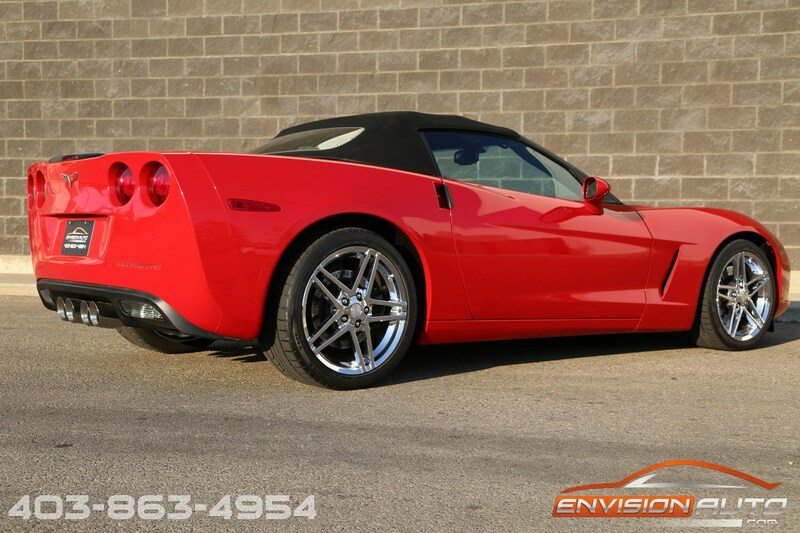 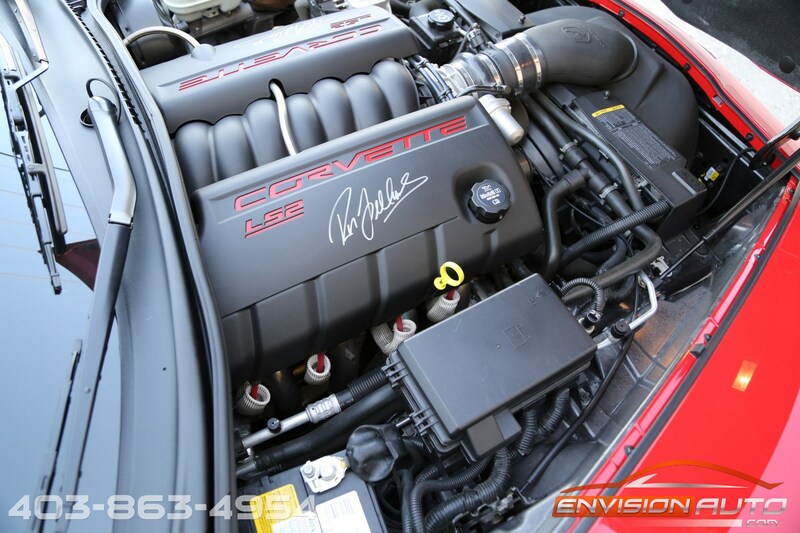 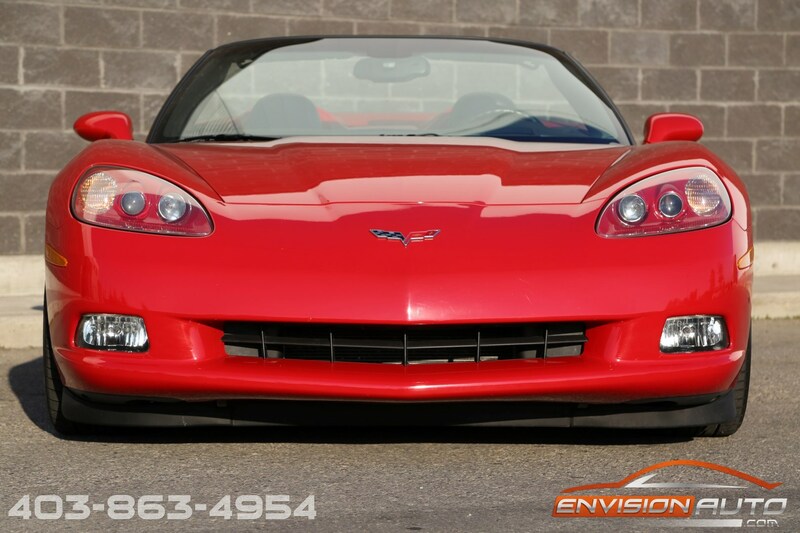 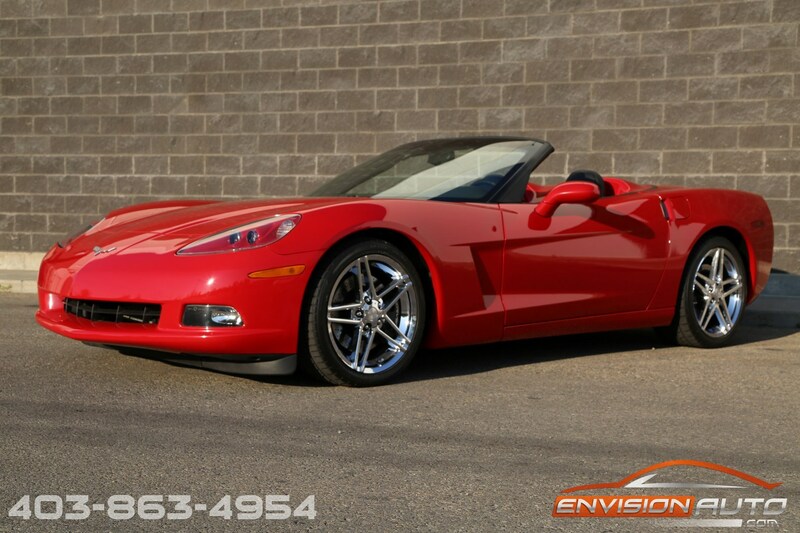 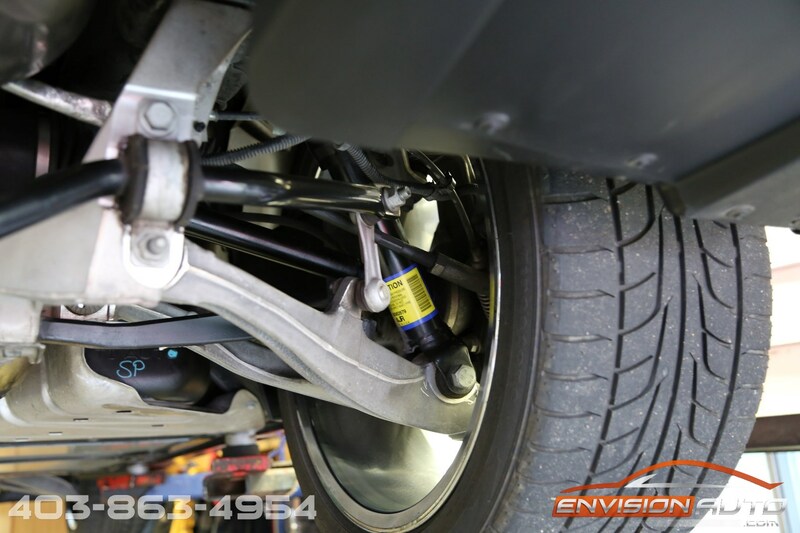 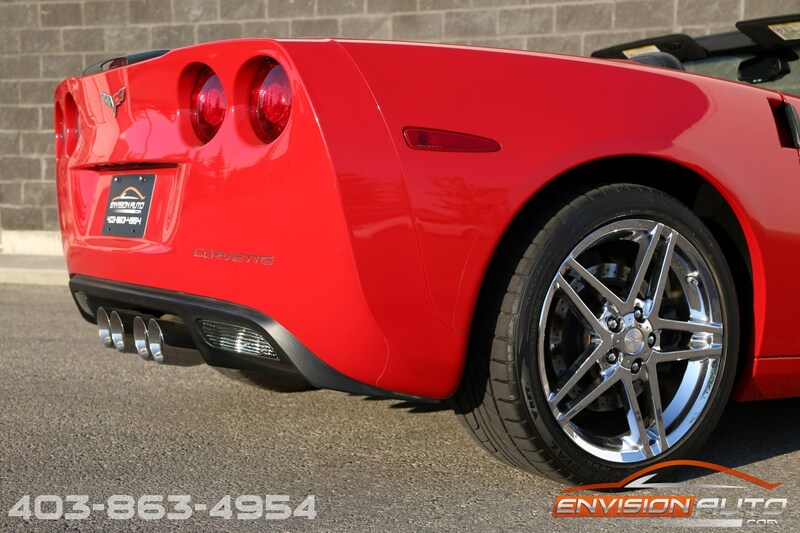 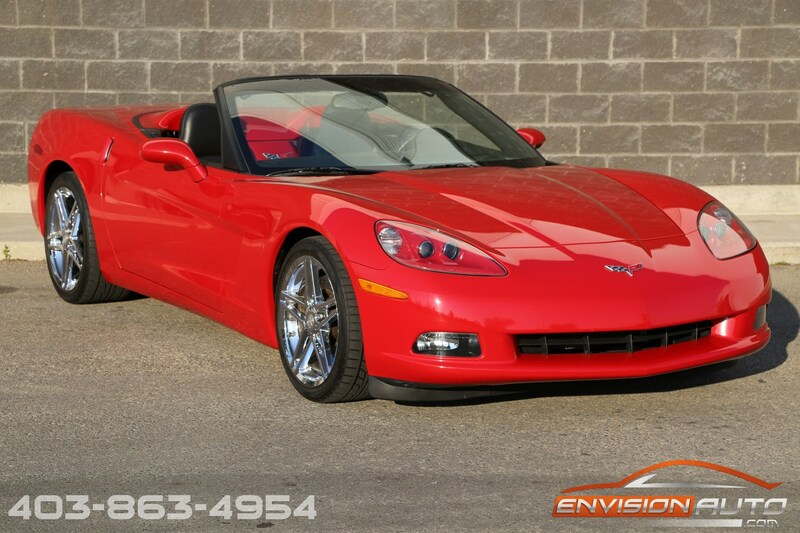 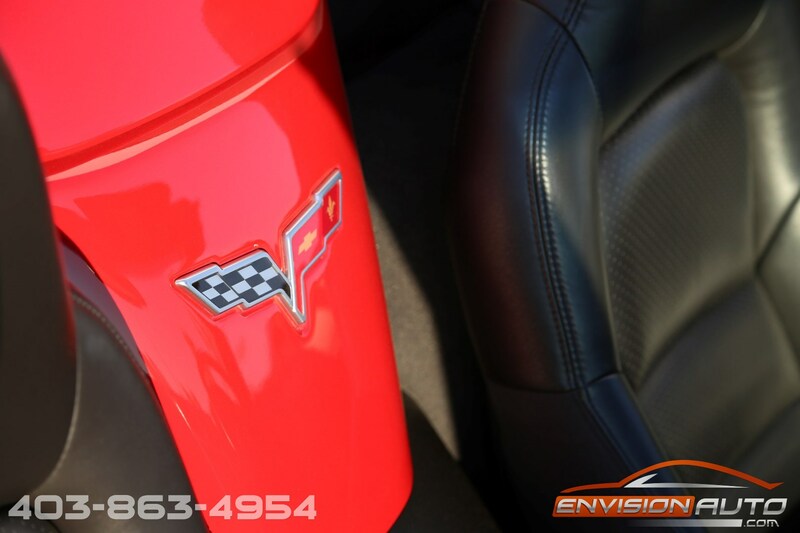 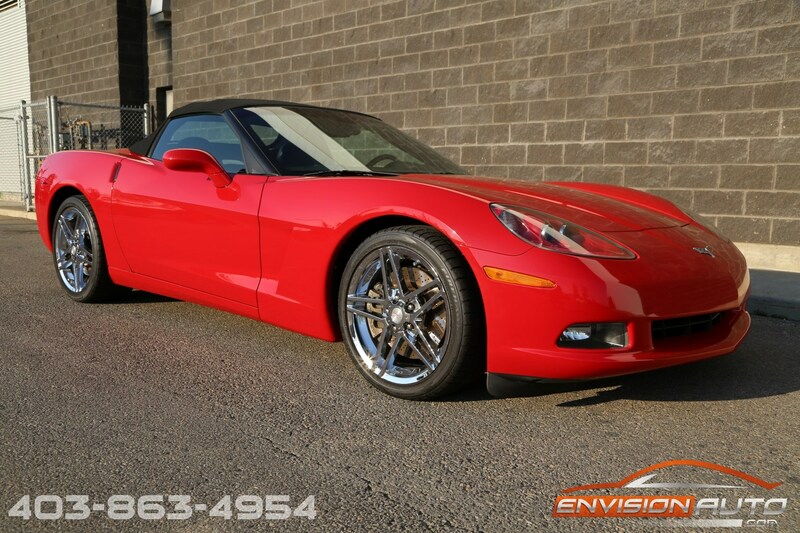 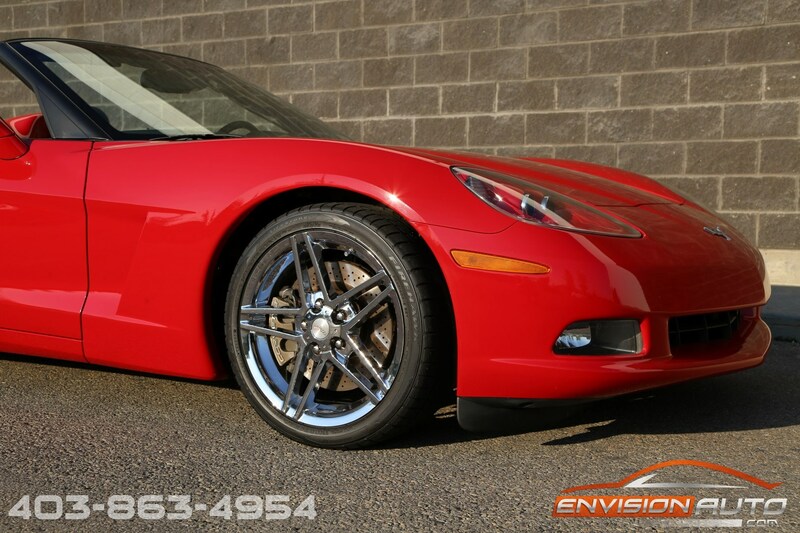 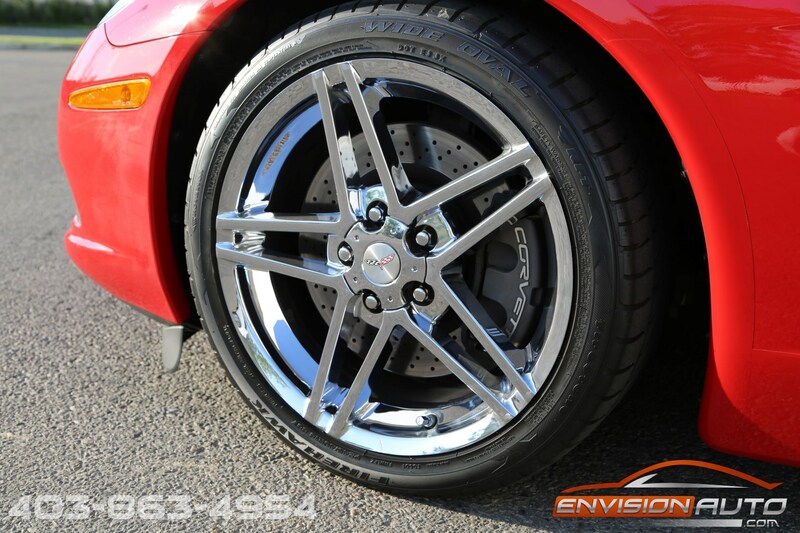 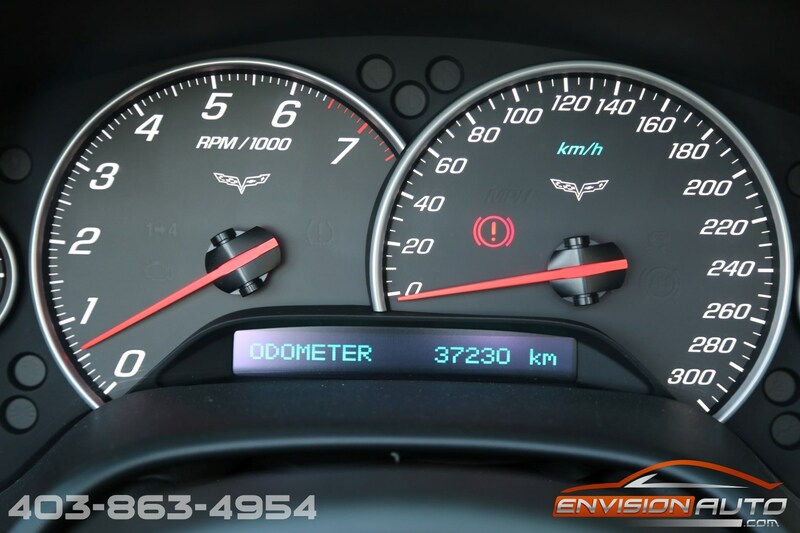 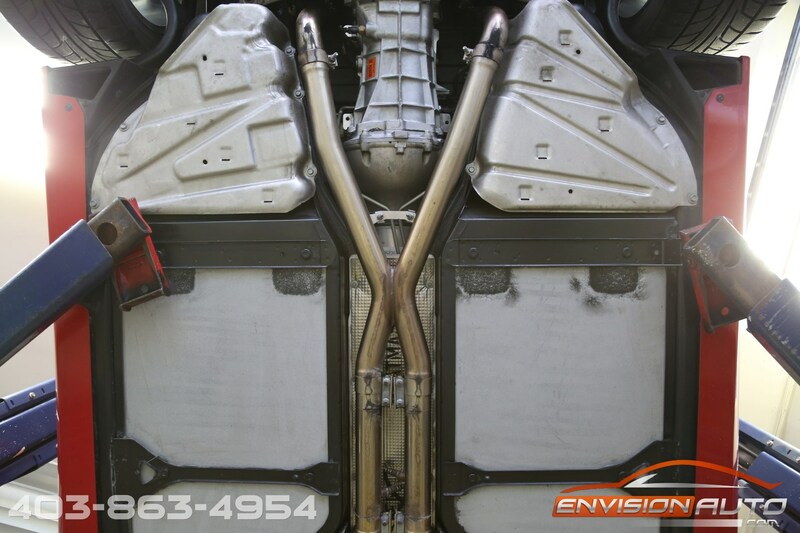 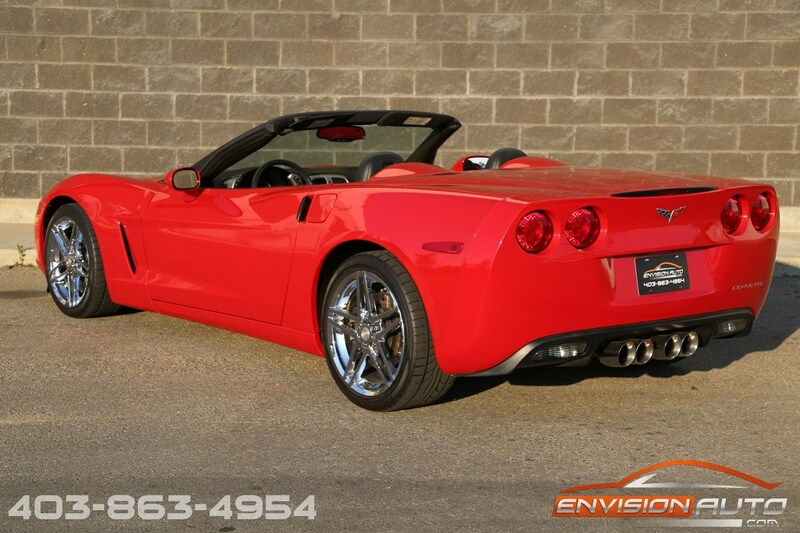 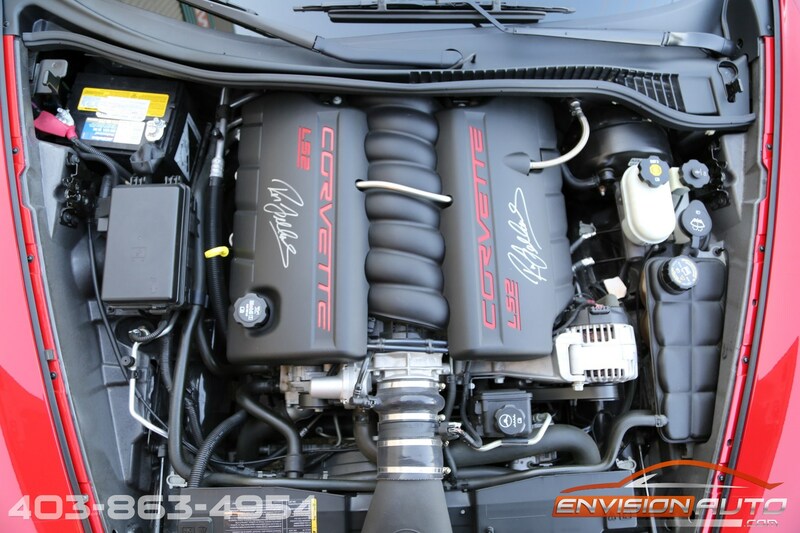 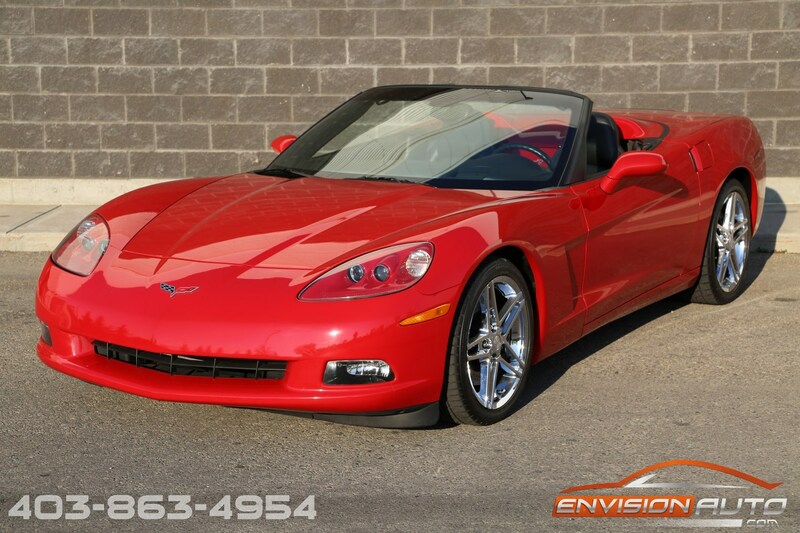 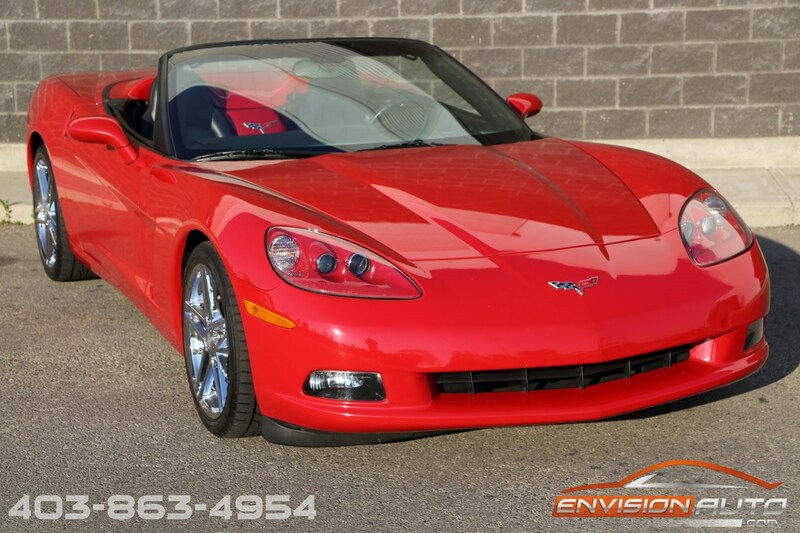 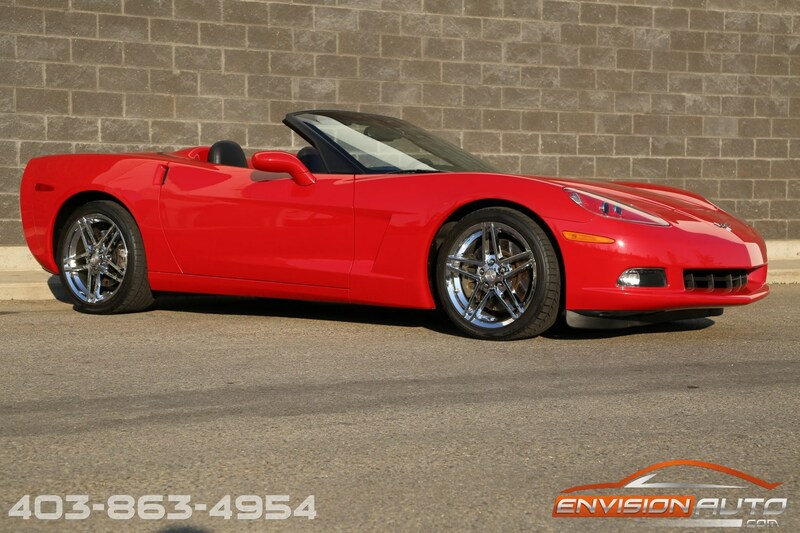 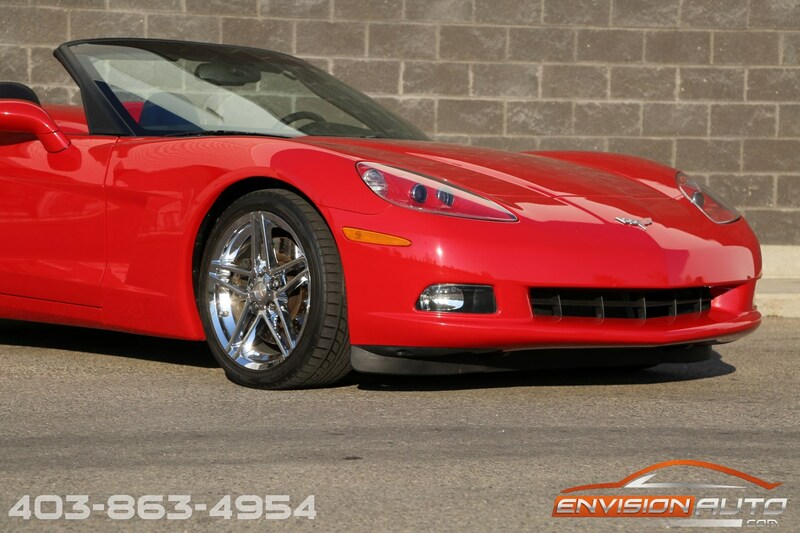 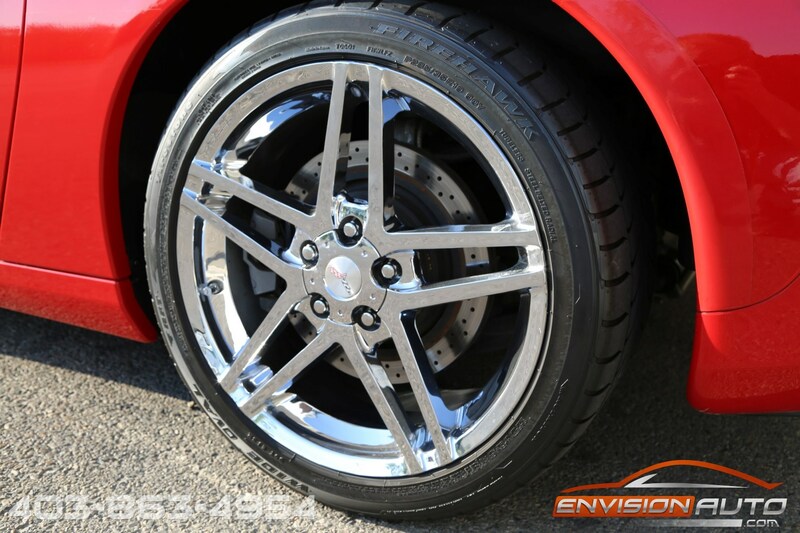 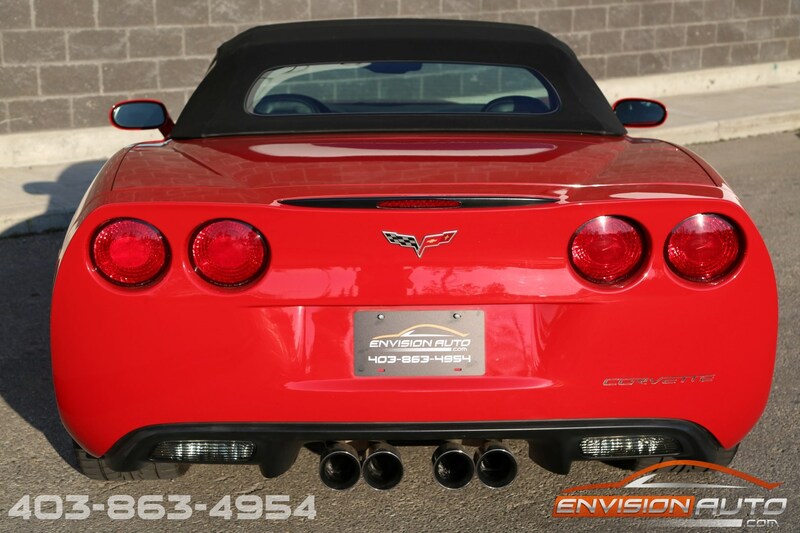 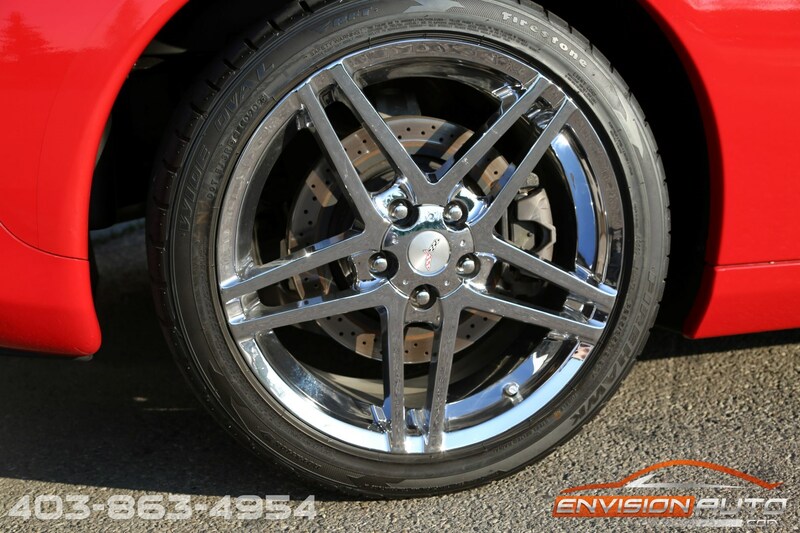 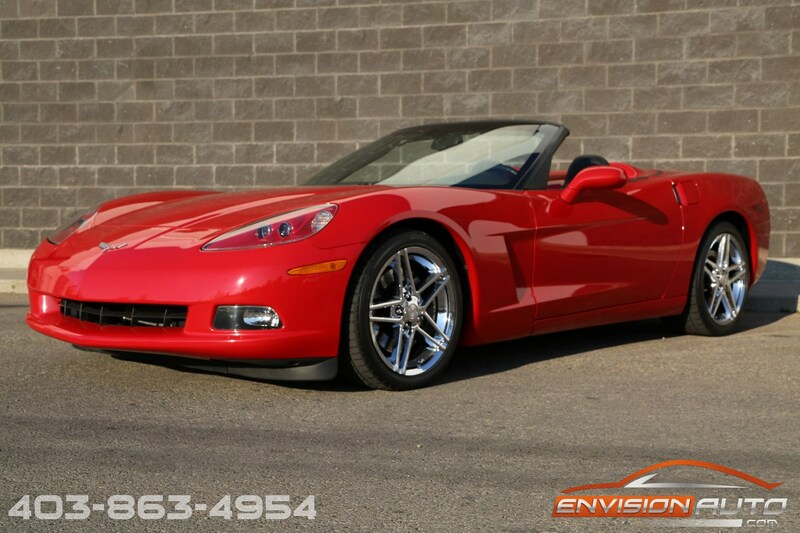 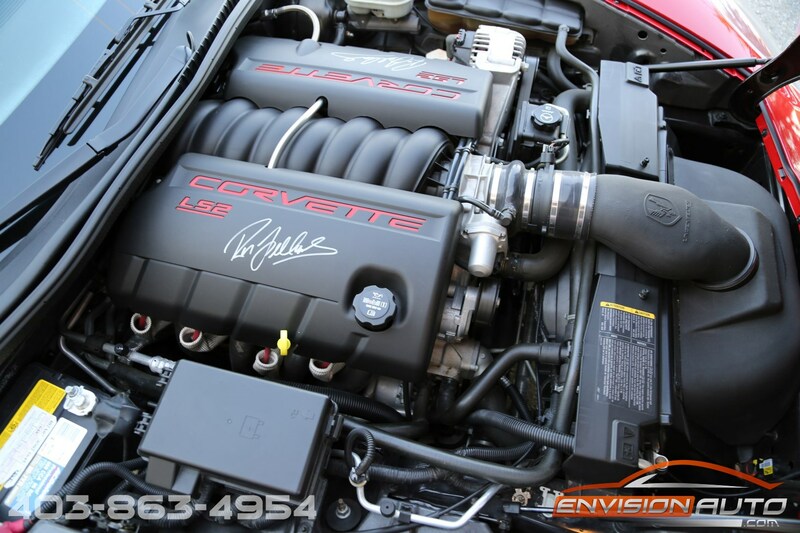 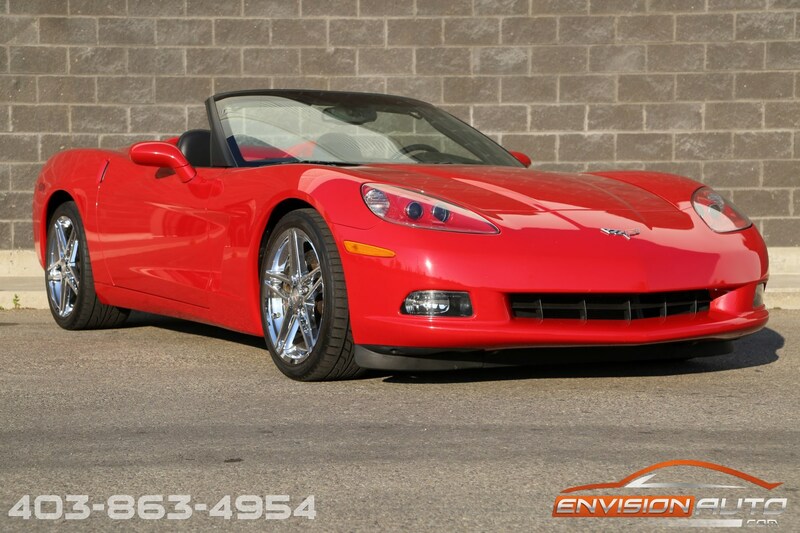 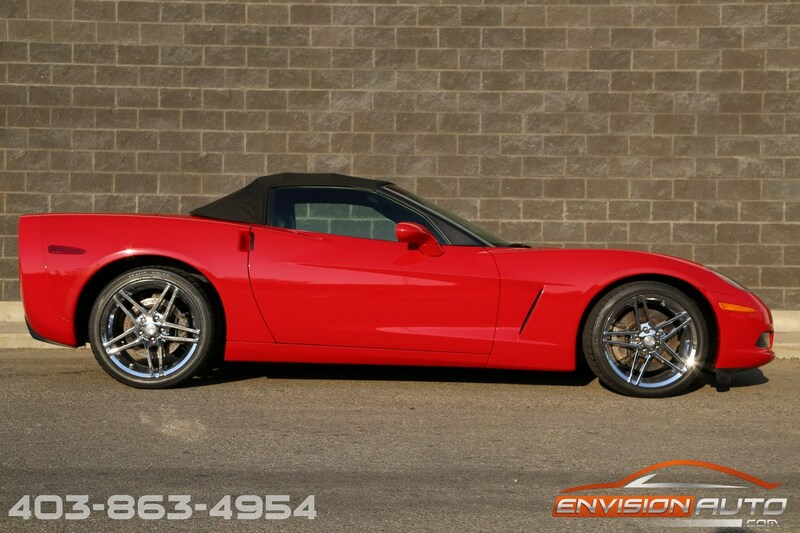 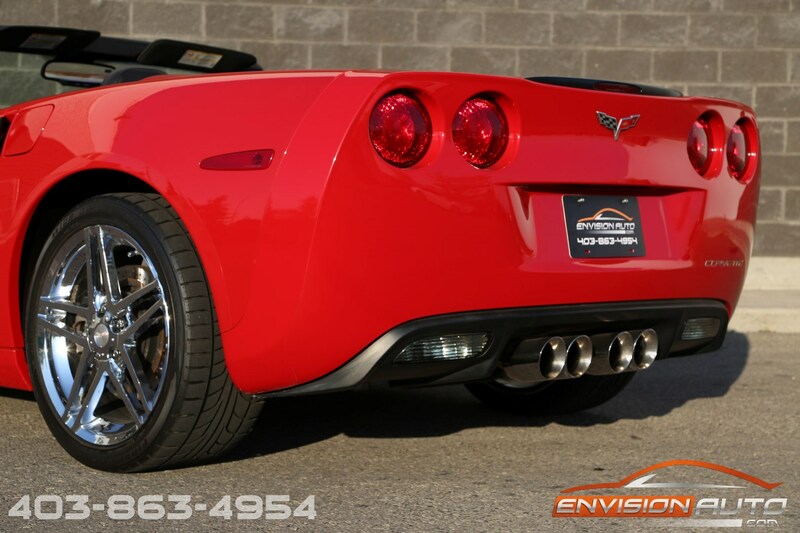 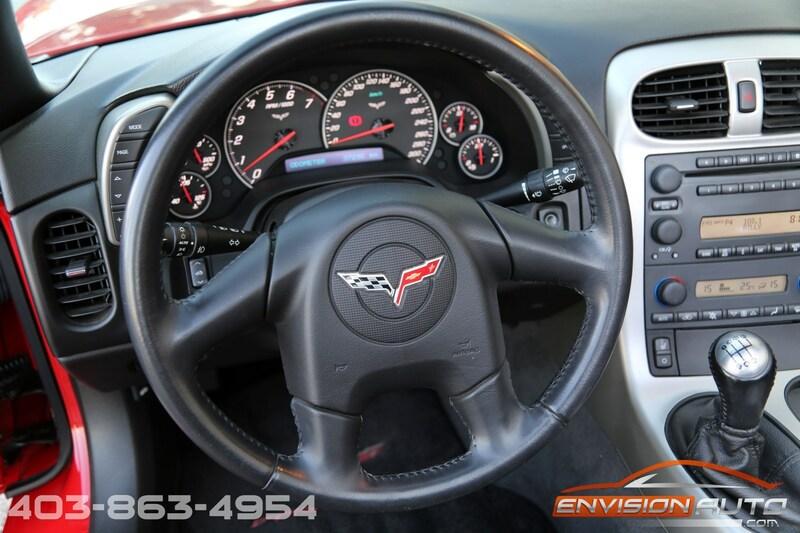 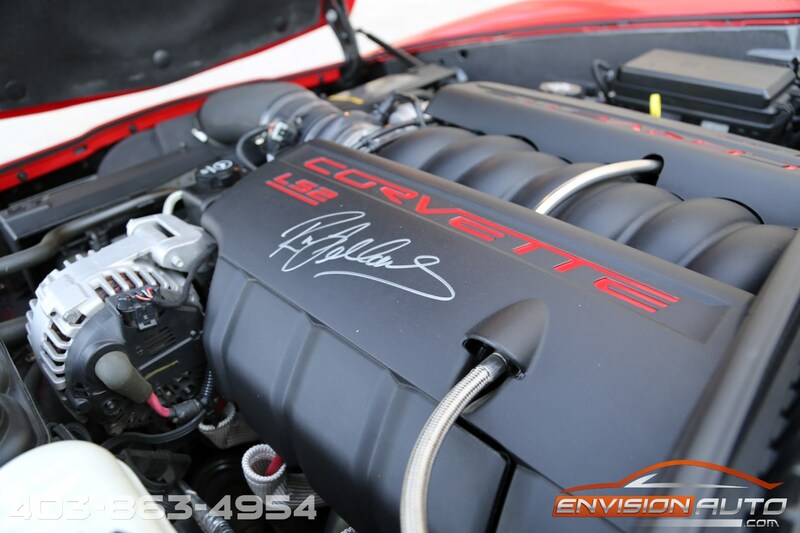 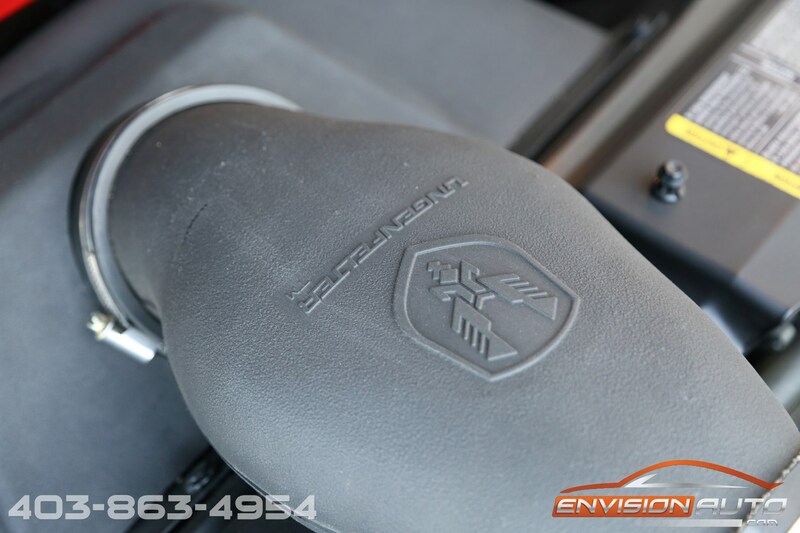 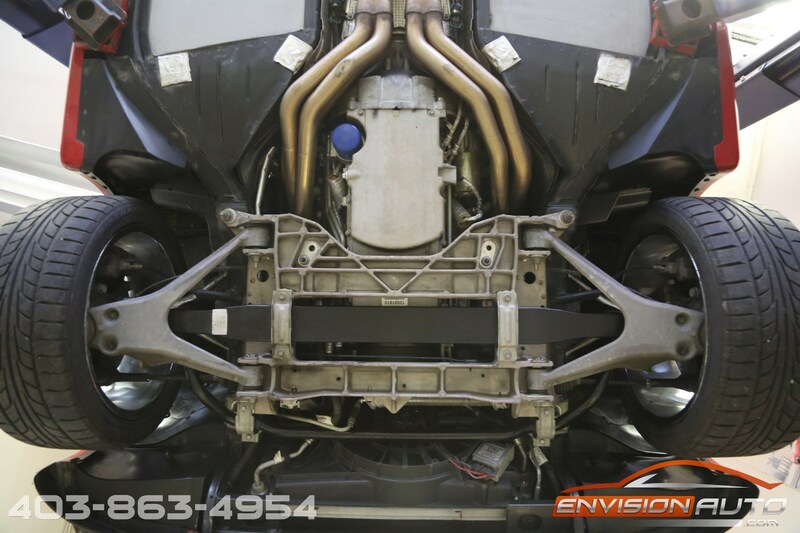 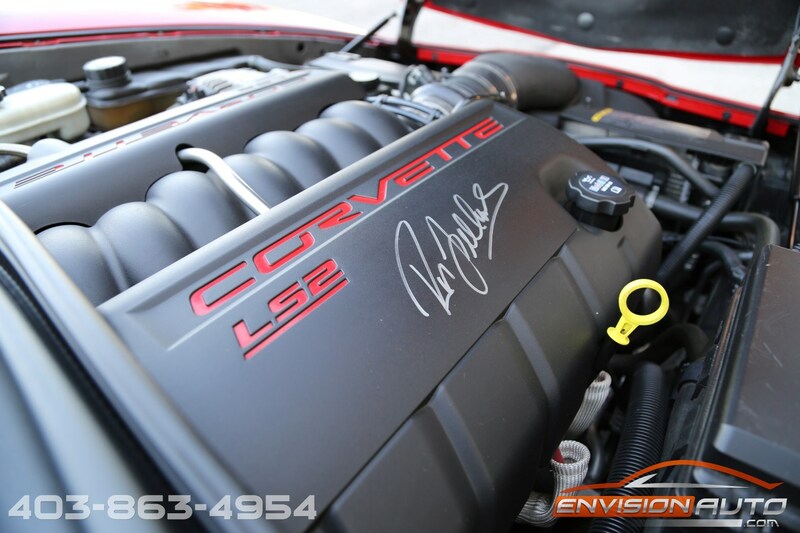 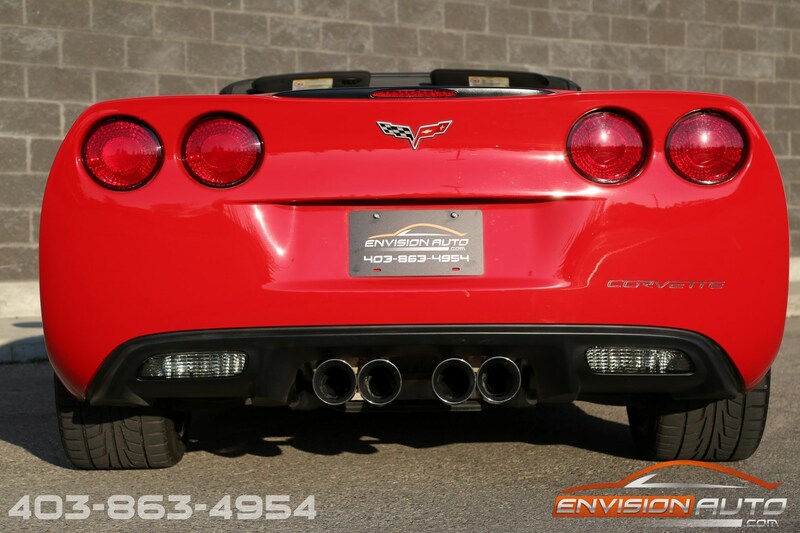 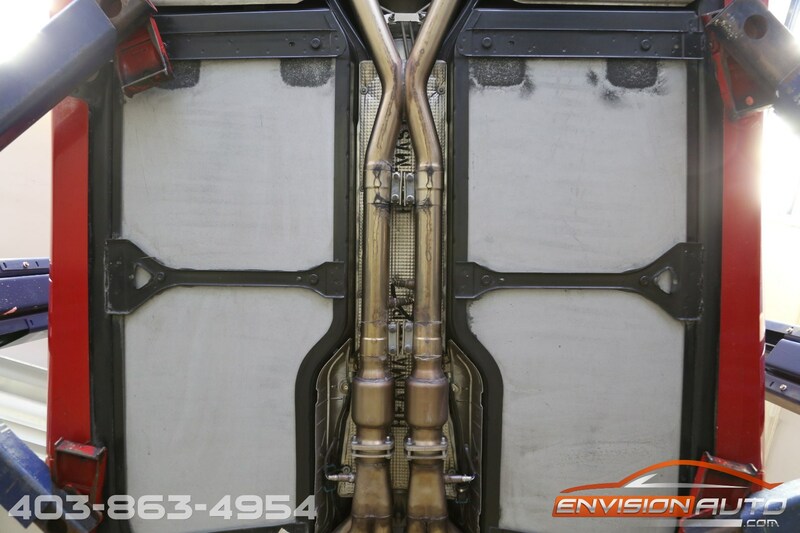 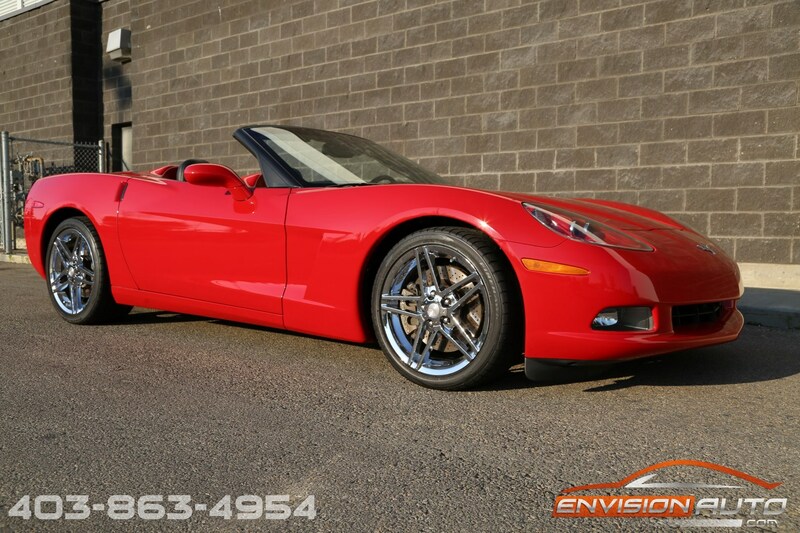 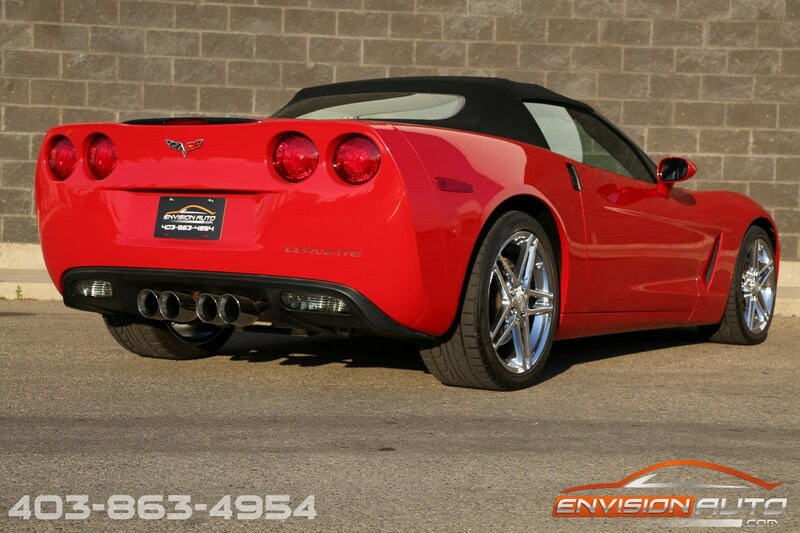 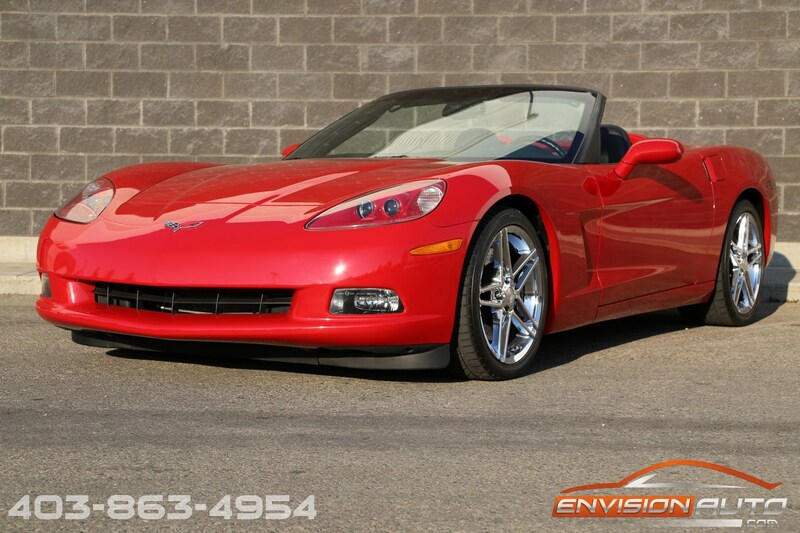 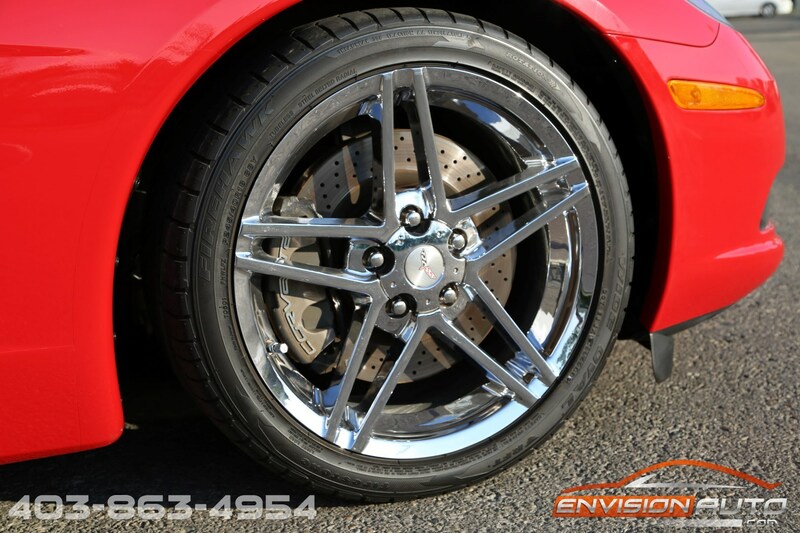 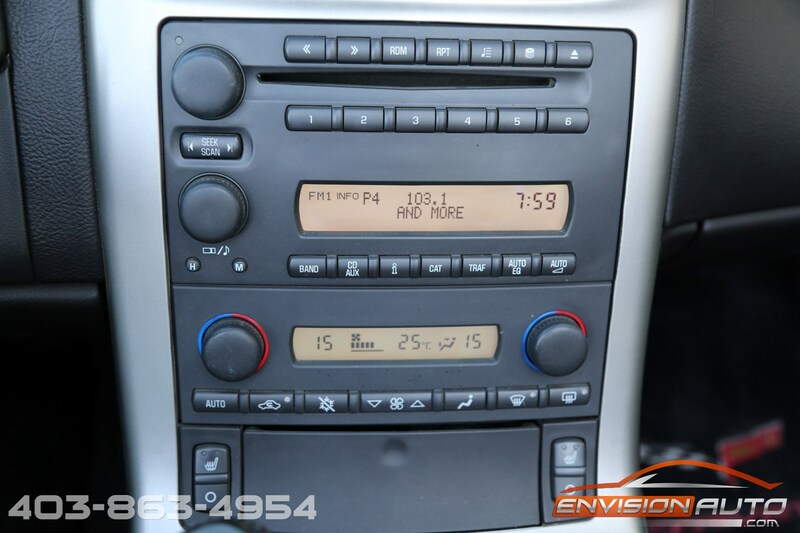 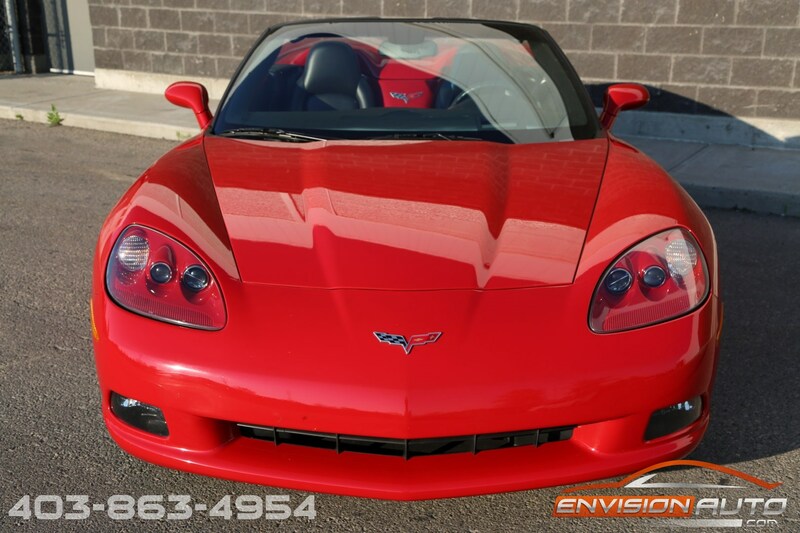 One of three C6 Corvettes that were just recently acquired by Envision Auto from their previous owners. 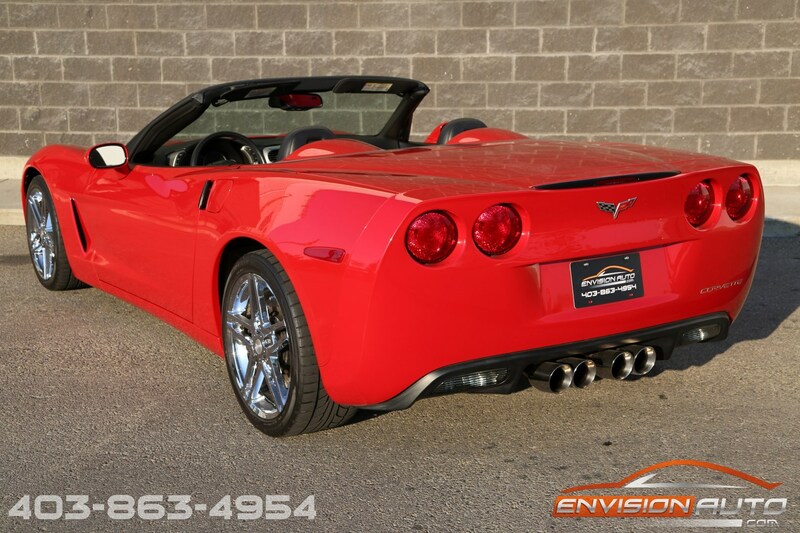 All immaculately kept in a year round heated garage under cover. 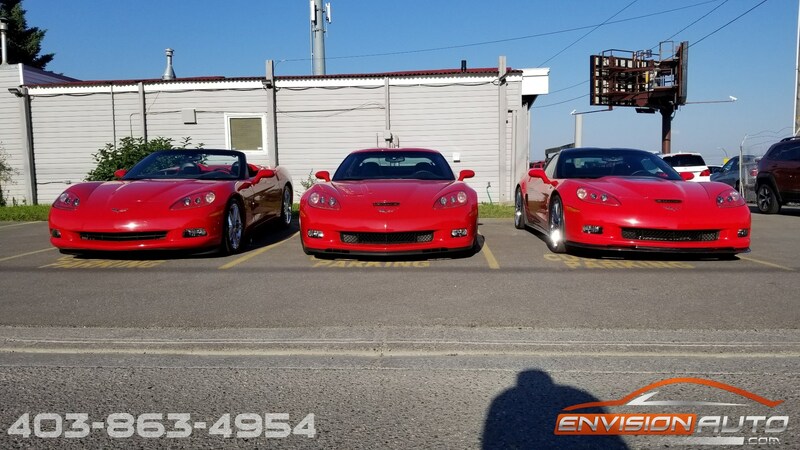 A testament to the care the previous owner gave this immaculately kept Z51 Convertible, the photos shown are exactly the condition that this Corvette was delivered to us in – no professional detailing or reconditioning required and not so much as a car wash required! 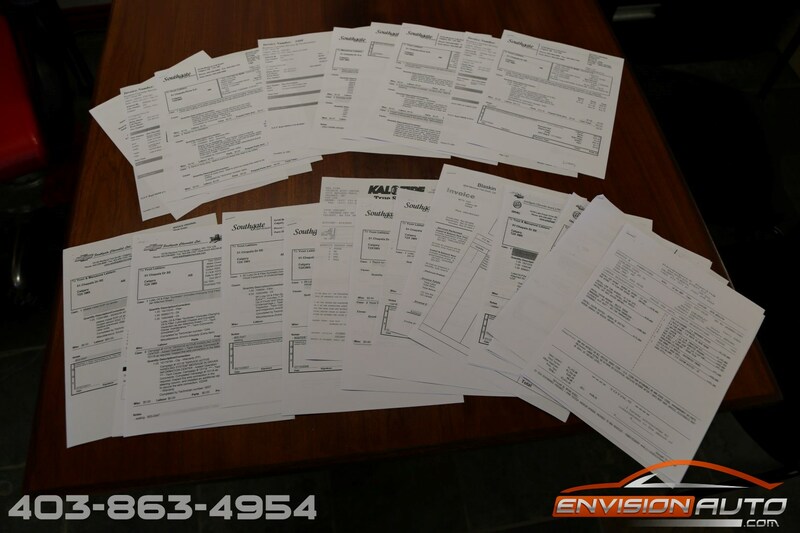 Complete fully documented history throughout including all invoices and receipts for all work performed. 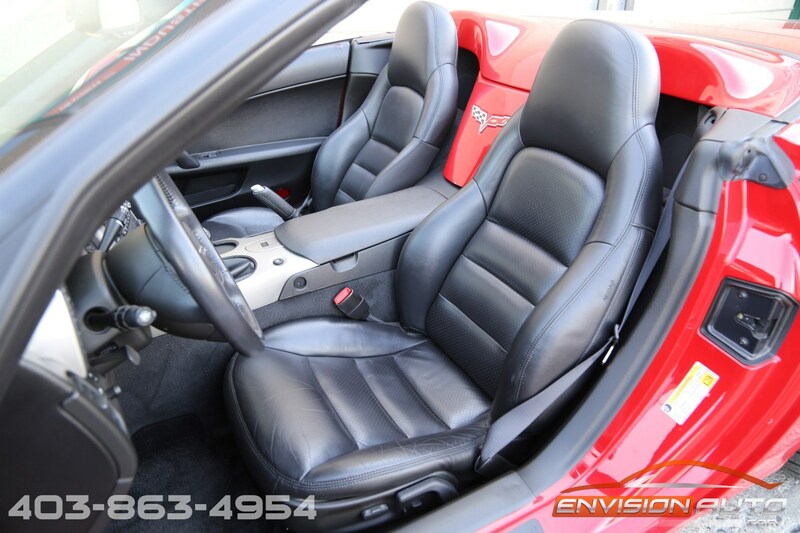 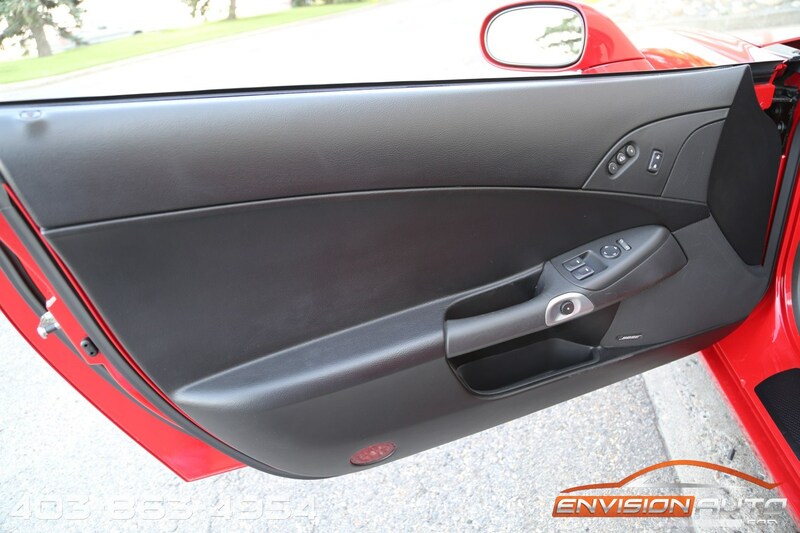 Absolutely stunning in Victory Red exterior finish over black leather interior trim with a matching black soft top. 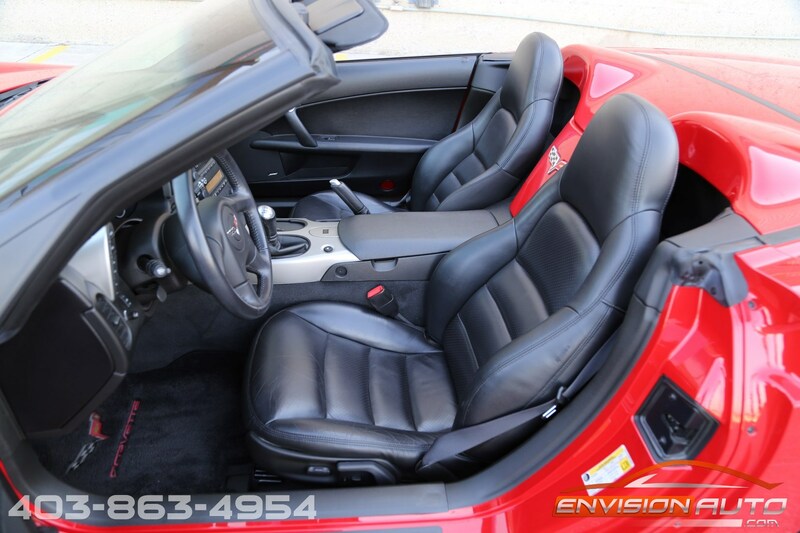 Factory options include the 1SB top trim interior option package featuring power soft top convertible, chrome aluminum wheel package, factory navigation, heads up display, and heated leather seats. 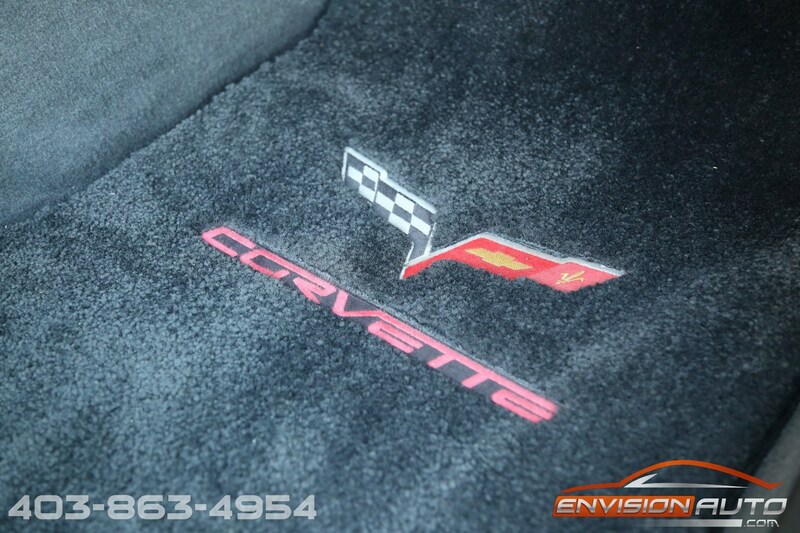 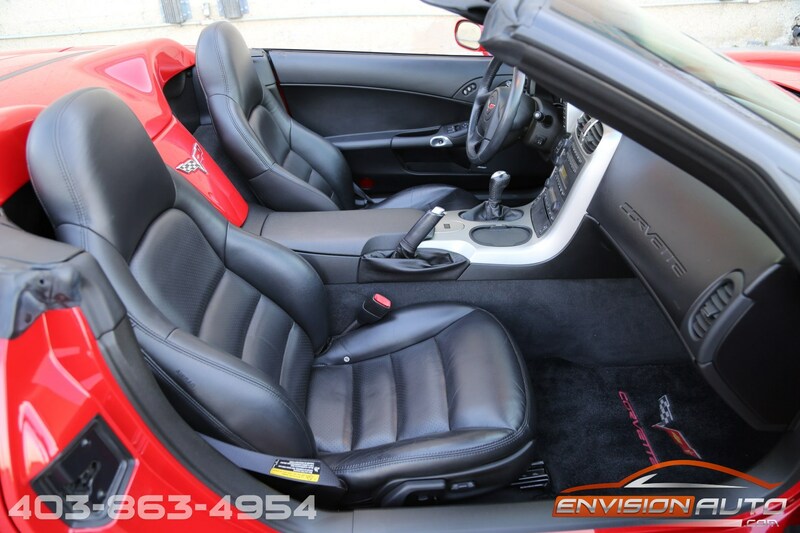 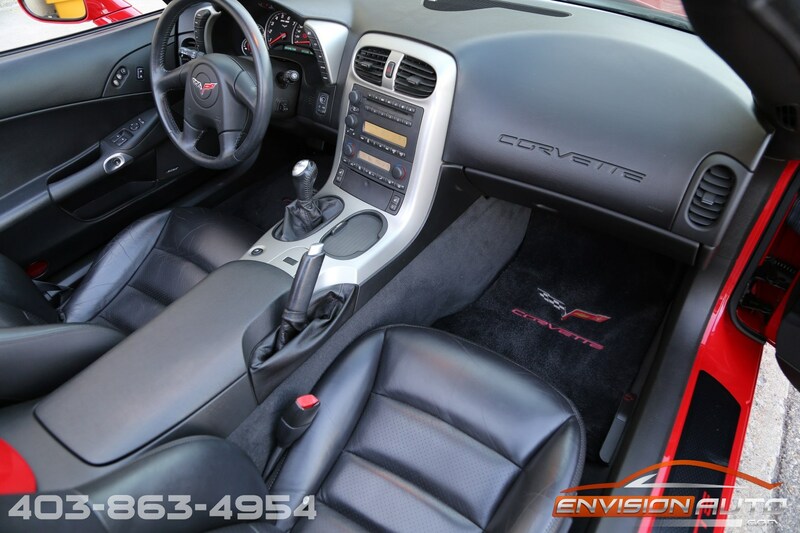 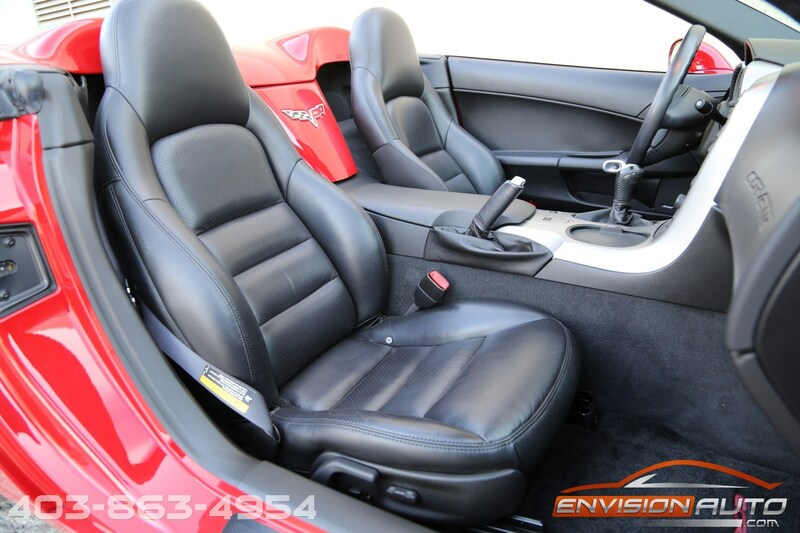 Upgraded plush Lloyd’s floor mats and rear cargo mat – all with custom Corvette embroidery are also included. 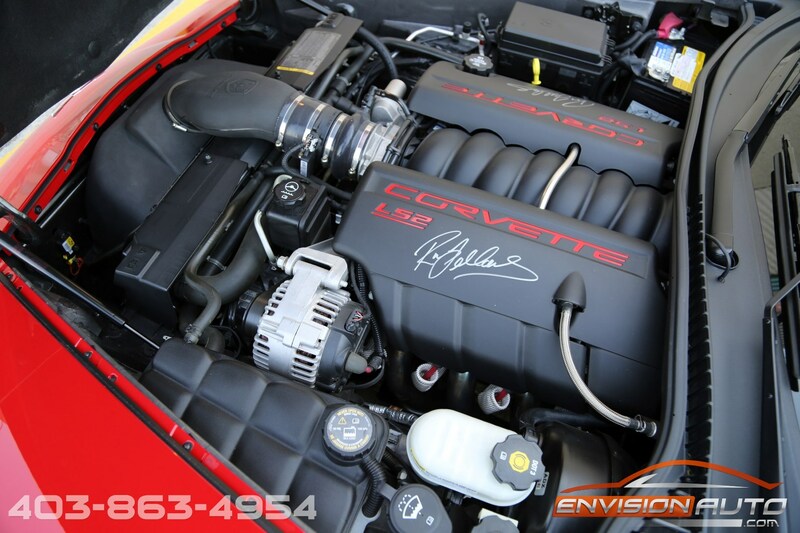 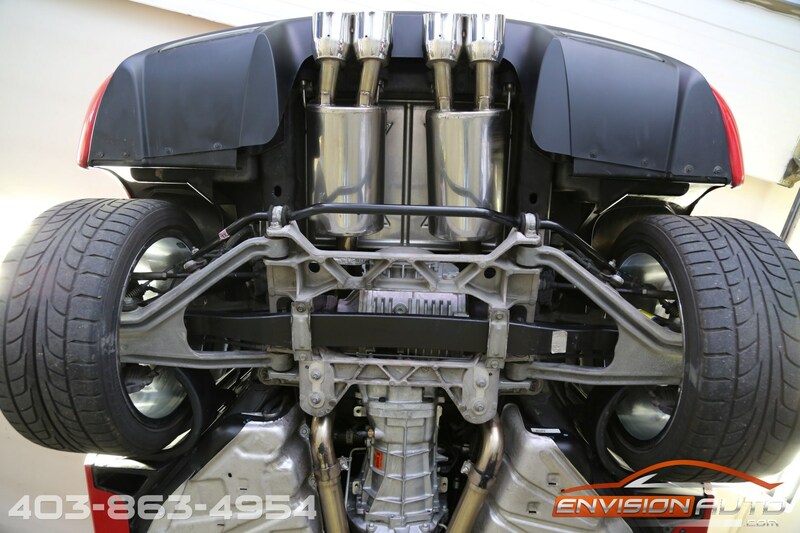 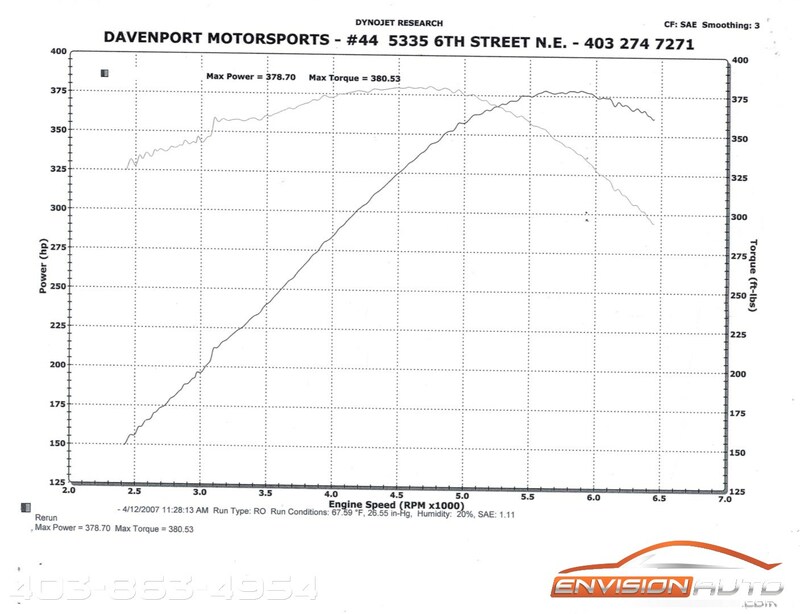 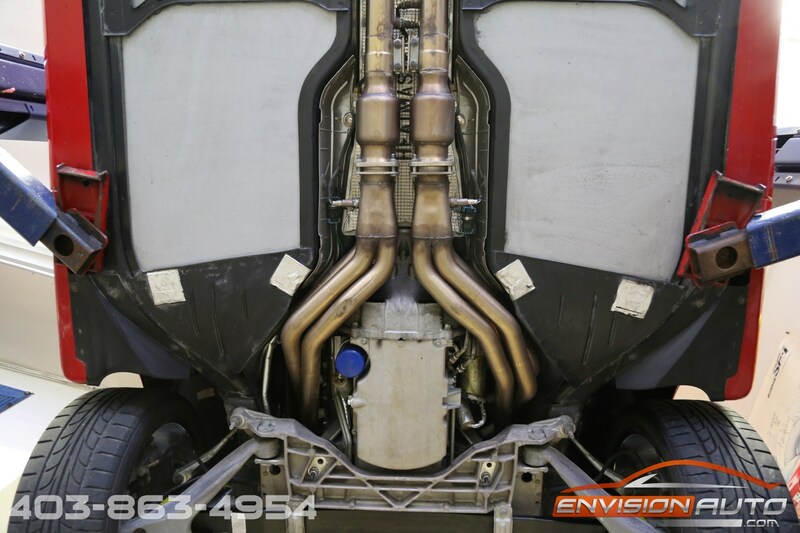 Tasteful modifications from Davenport Motorsports in Calgary bring this Z51 Convertible up to an estimated crank horsepower rating of 450HP – 380 Rear Wheel Horsepower and 380 Rear Wheel Torque. 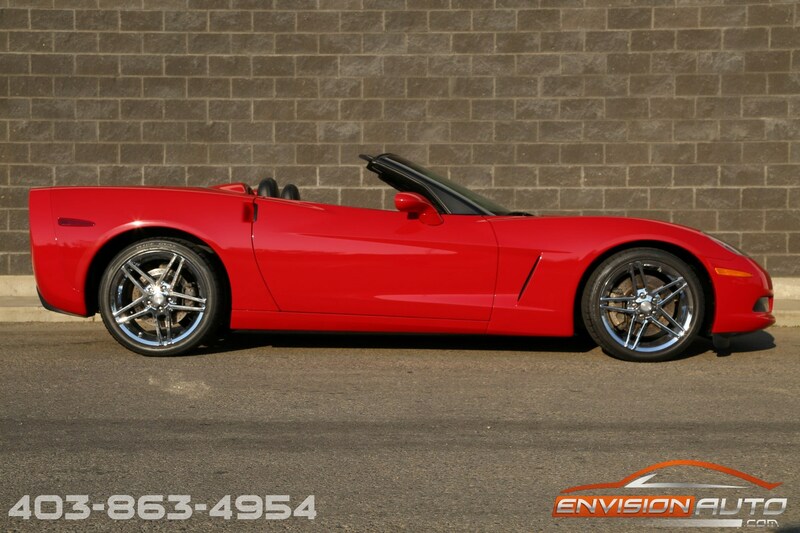 Modifications include: Lingenfelter Cold Air Intake, B & B Route 66 Exhaust ( T-304 Stainless Steel ), 1 7/8inch Long Tube Headers, MSD Ignition Wires, KoolSox Wire Heat Guards, Custom Computer Programming and a Callaway Shifter. 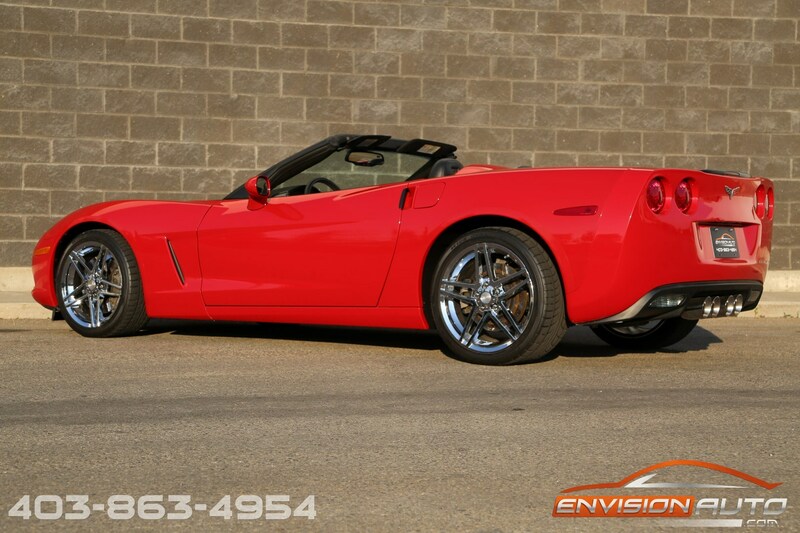 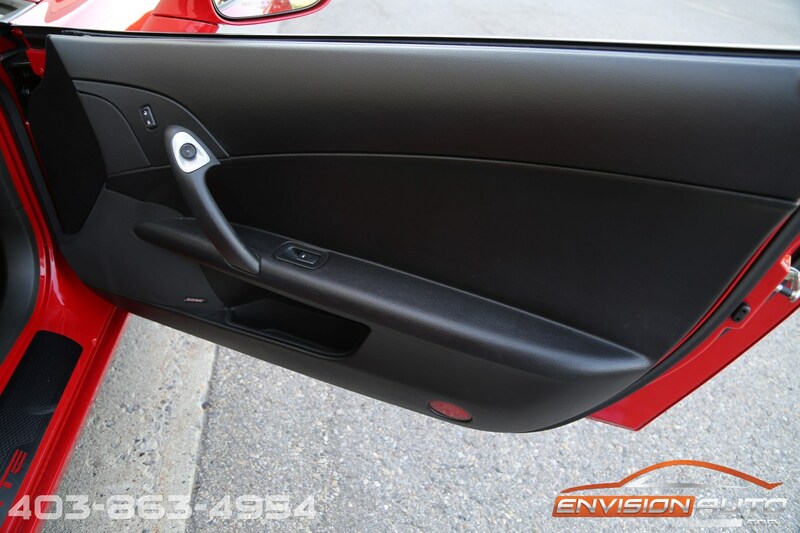 The exterior of this Z51 Convertible has been treated by Shadow Tint in Calgary to a exterior clear protection film wrap package at a value of over $1,000. 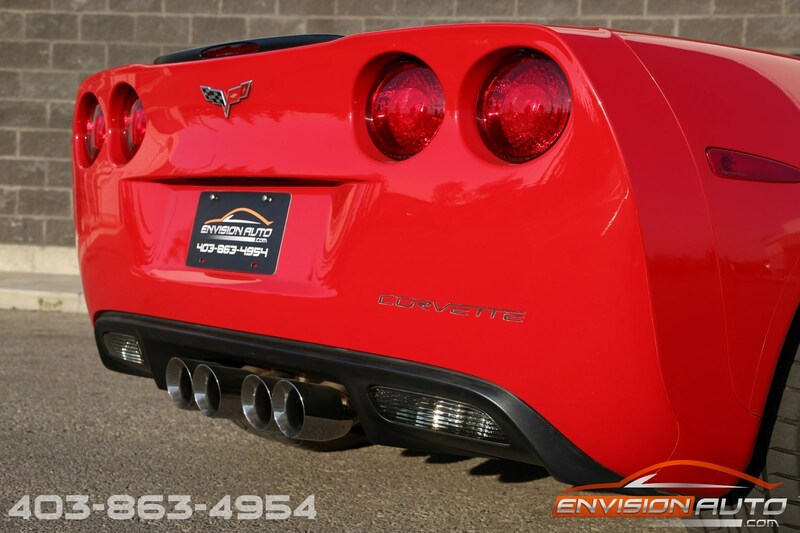 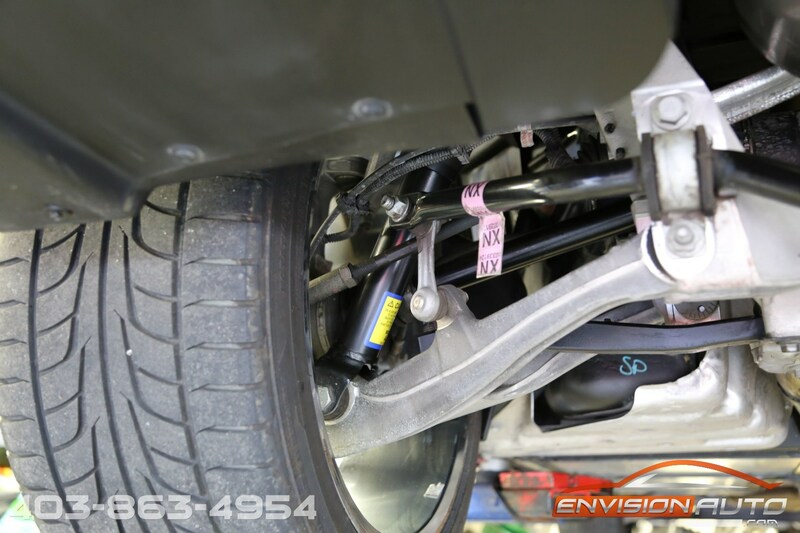 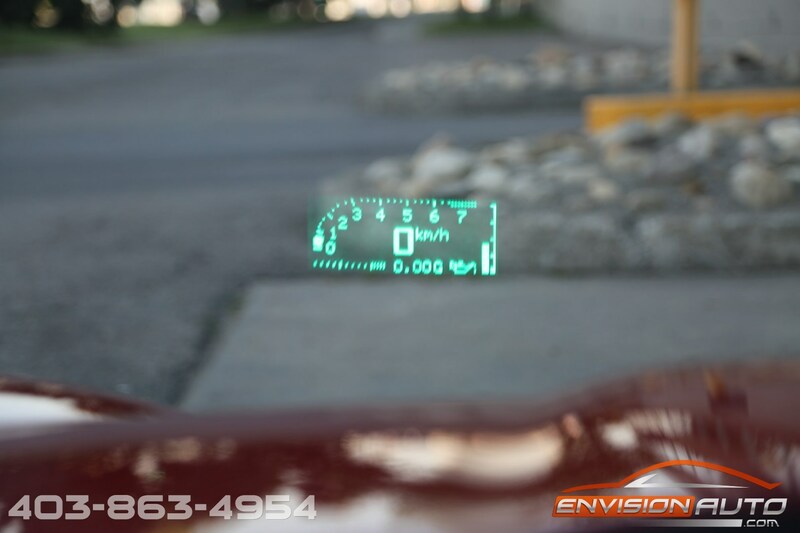 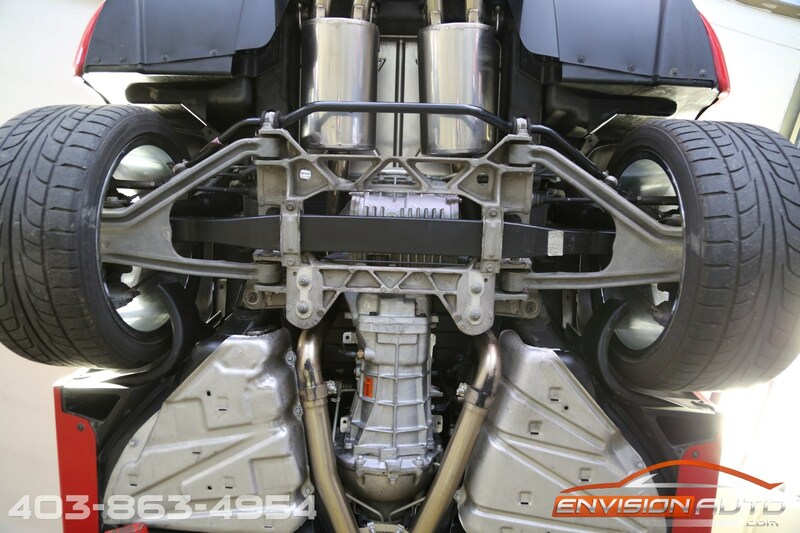 Coverage includes the hood, fenders, bumper, rockers, extended doglegs, lights, markers, and more! 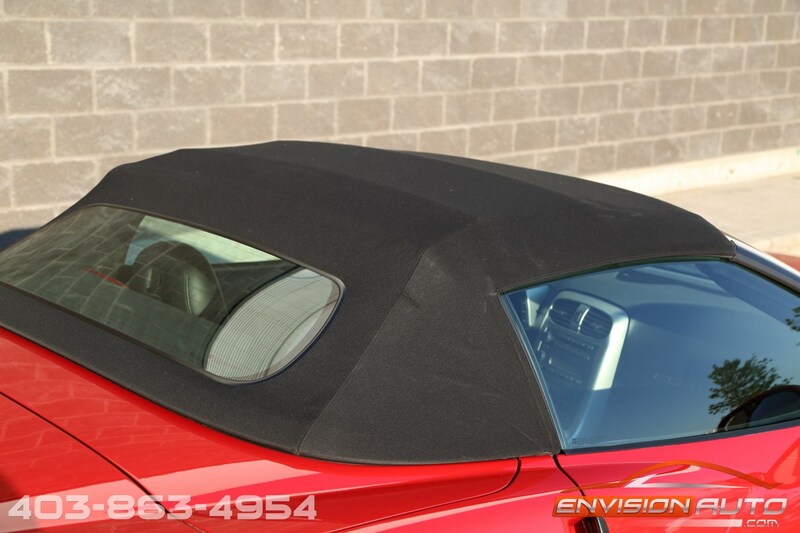 Included with the sale is a GM factory original Corvette custom car cover that has been protecting this car while stored indoors. 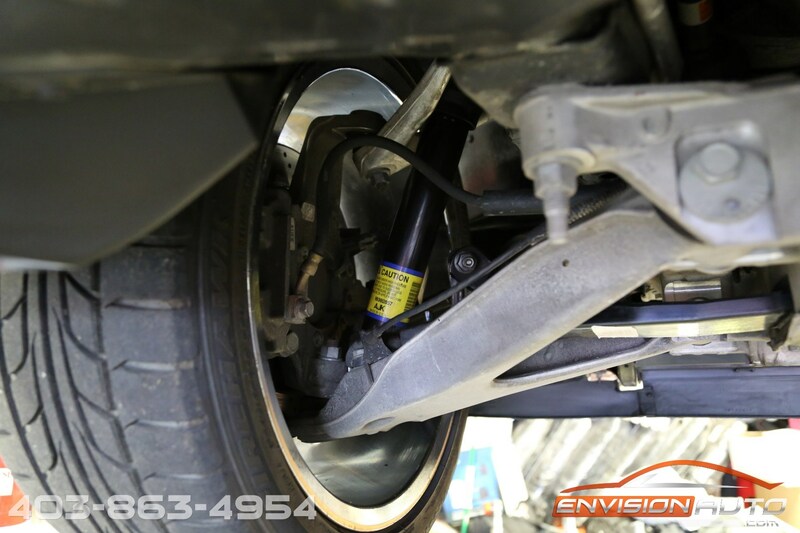 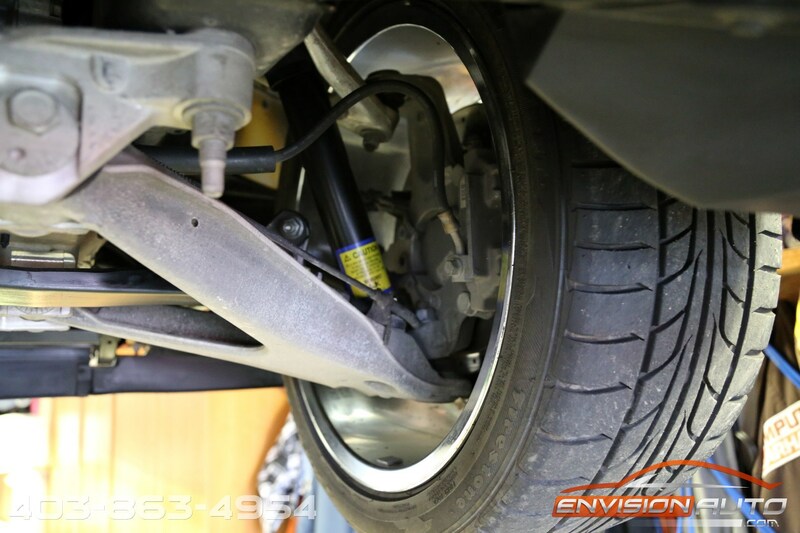 Tires on the car are top rated Firestone Firehawk Wide Oval Runflat and all four are currently measuring 7/32nd of tread remaining (from a new 8/32nd) – being as the car has been stored in a heated indoor storage facility all it’s life the tires are without flaws.